O’Neill – Caden Moore a former O’Neill Eagle had a fantastic freshman year for the Wrestling Team at Northern State University. Moore went 22-7 in his freshman season and 6-1 in the NSIC. Moore also led the team in wins, decision wins, and major decision victories. Moore won the Finn Grinaker Open, placed second at the DWU Open and sixth at the Midwest Classic. Moore was also ranked for multiple weeks throughout the season with his highest ranking of seventh at 149 pounds. 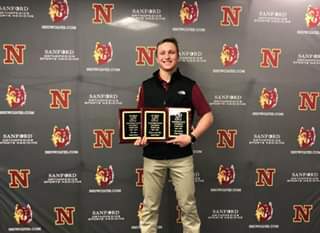 Moore’s impressive resume in his freshman season earned him Newcomer of the year and the Most Valuable Wrestler for the Northern State Wolves! Caden is the son of Jesse and Melissa Moore.